"This year, it made decisions about the sale of 2 million tons of grain. The first 500 thousand tons have already been sold for export only. It was the old crops, in fact we got rid of the grain, which was stored since 2010. Was first used the mechanism of the sale through the stock exchange", — said Yuriev. 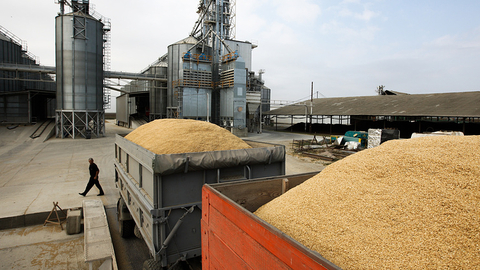 According to him, the first batch of grain exported to 20 countries, and the next batch will go for export and milling enterprises and producers of animal feed in the Russian market. "We started to accredit bidders. By order of the Ministry of agriculture of the Russian Federation, we will deliver weekly to 50-100 tonnes on the Russian market. Grain prices will decline as we sell grain from Federal intervention Fund", — said the Deputy Director of UGC. He mentioned that the drought this year reduced the grain harvest by regions in average by 25%, but the losses will cover last year's record harvest. The prices for bread will not grow, as the rising cost of flour used in bread baking, will not exceed 20%, which will allow the price of bread to remain at the same level. "On average we get to the end of the year 105-110 million tons of grain, which fully meets the internal needs of Russia in the 76-77 million tons of grain. Five years ago, on average we received about 80 million tons, and now 110 tons — triggering the entry into circulation of the additional land, which has fundamentally affected the current picture", — concluded the Deputy Director of UGC.